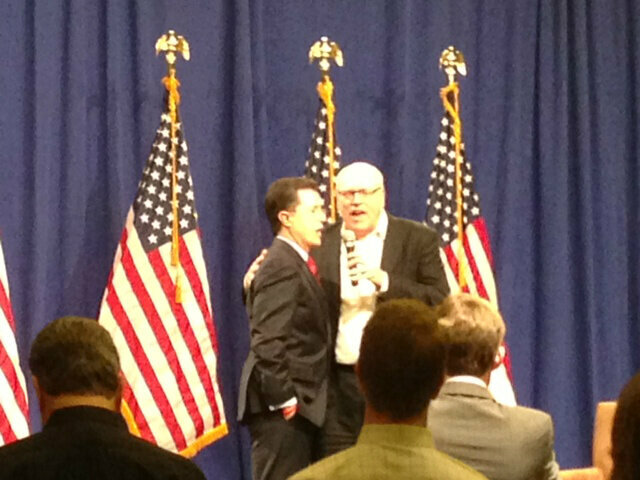 Comedian Stephen Colbert made a "surprise" appearance today at the House Democratic retreat, delivering a characteristically unpredictable performance in which he proclaimed himself "best frienemies" with House Minority Leader Nancy Pelosi, sang the Star Spangled Banner with Rep. Joe Crowley, D-N.Y., and threatened to bring up his sister's eighth grade diary as a key issue in her congressional campaign. Colbert, whose older sister, Elizabeth Colbert-Busch, recently launched a bid for South Carolina's 1st congressional district, promised that his sister is "tough as nails," and is "going to win," according to an aide in the room. But, he quipped, "I have a few questions for her from her eighth grade diary." The Comedy Central host, who adopts a satirically conservative persona during his show, "The Colbert Report," said he wasn't sure if Democrats would take back the House in 2014 - but he also noted that he's "not sure if [the] American people care either way." "Congress is less popular than colonoscopies," he said. Still, he acknowledged that he is not without some acquaintances among the chamber. We are "best frienemies," he said, of Pelosi. "We may have disagreed in the past and today we will disagree in the future." House Democrats are gathered in Leesburg, Va., for their annual retreat. Former President Bill Clinton addressed the group this morning; President Obama spoke to them yesterday. Jill Jackson is a CBS News senior political producer.